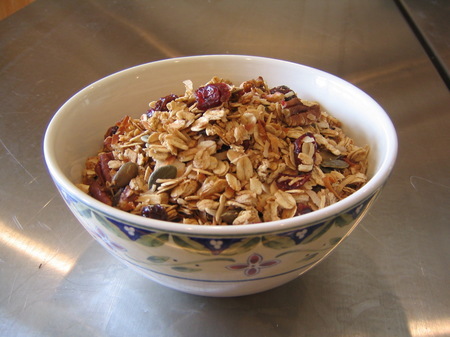 This is my mom's granola recipe- I think I will make it today. Yummy breakfast! 2. Combine oats, wheat bran, coconut, walnuts, brown sugar, cinnamon and salt in a large bowl; stir well. 3. Stir honey, oil, milk and vanilla in a small saucepan over low heat until mixture fizzes around the edges. Pour over oat mixture and stir well. 4. Spread onto prepared baking sheet. Bake about 25 minutes, until lightly browned, stirring often. Place baking sheet on a wire rack and cool undisturbed until room temperature, about 1-1/2 hours. Break up and store in a large container at room temperature up to 1 month.